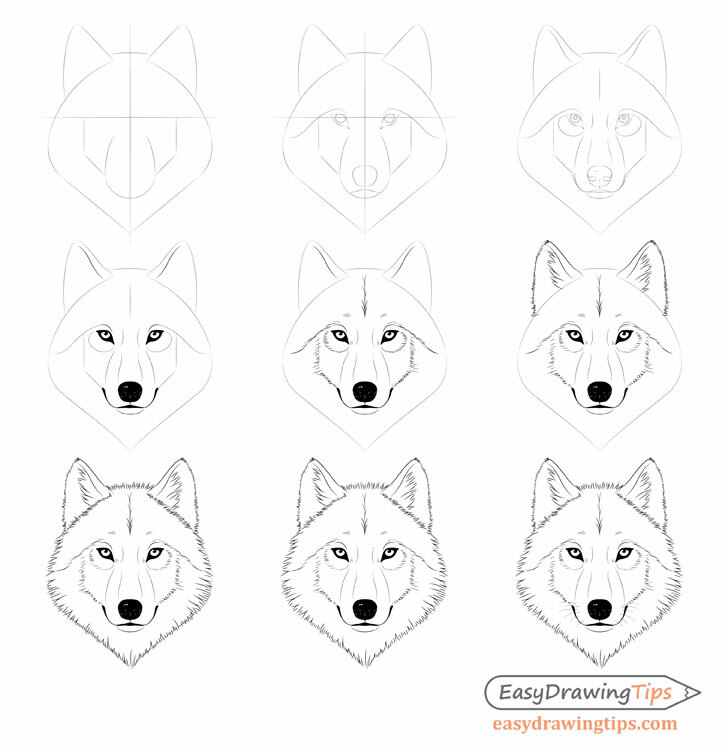 This tutorial explains how to draw a wolf’s face and head step by step from the front view with detailed line drawing examples for each step. This is a fairly long tutorial but if you follow the steps below it should not be all that difficult even for beginners. Please note that if you are drawing on paper it is a good idea to do the initial construction parts of the drawing with very light pencil lines. For the later stages you can either draw more solid pencil lines or use a pen or a marker. Start the drawing by making a construction line sketch of the wolf’s head to establish it’s basic shape and proportions. With this you should have the very basic shape of the larger parts of the wolf’s head. Position the eyes with their top end slightly overlapping the horizontal line from the the first step. You can also use the same line to help you make sure both eyes are on the same level. From above the “eyelids” and transition these into two “wave like” lines that go to the outer sides of the head. 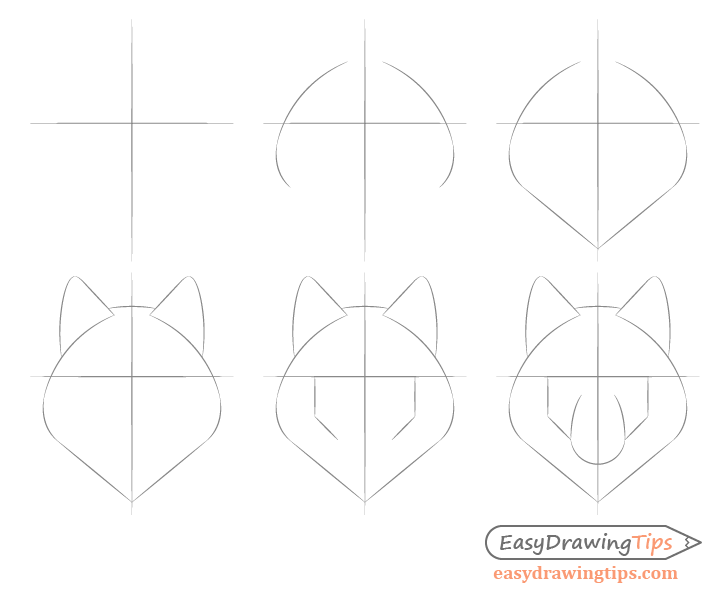 These will be used later to help draw some of the wolf’s fur patterns. Finally draw the nose (wider towards the top and narrower towards the bottom). 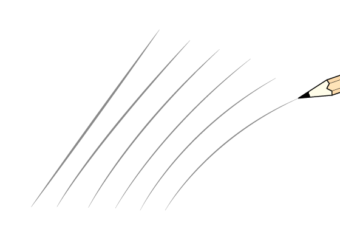 At this stage draw the mouth with just two straight angled lines from the bottom part of the snout curve towards the nose (but not touching the nose). 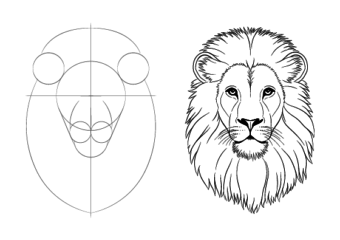 Now refine the shape of the face by replacing some of the straight construction lines with more organic curves that better define the shape of the wolf’s head. The places where you want to add these lines will be the inner sides of the ears, the upper part of the snout, the mouth, and the bottom of the head. Now draw some of the smaller details of the wolf’s head. Add another set of “wave like” lines along the snout to better define it’s shape. 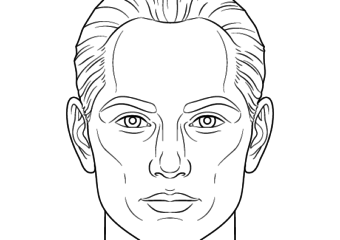 Draw these starting close to the nose and end them pointing towards the inner corners of the eyes. Draw the eyes and surrounding details as shown above. Inside the eyes indicate the pupils along with a small set of circles for the highlights (reflections of light) as well as pair of lines near the upper halves of the irises to indicate the area that will be shaded later. For the nose add the nostrils as shown above and give a hint of the “split” line wolf’s have in the middle of their noses. You can also indicate a tiny area for the highlights to leave white when shading. Draw the sides of the mouth slightly sticking out from the sides of the snout as shown above. You can also draw a a hint of the wolf’s bottom lip up above the bottom of the lower jaw. 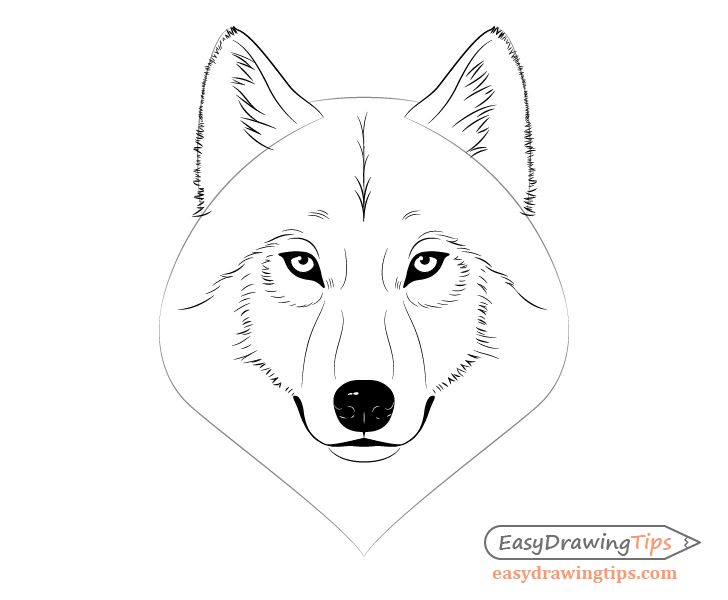 Now shade the wolf’s facial features as shown above (or basically just fill them in with a black or dark color). If drawing on paper it may be a good idea to use a pen or a marker starting from this stage of the drawing process. Doing so will let you easily erase the construction lines without effecting the parts of the drawing that you actually want to keep. Just be sure to wait for the pen/marker to dry before erasing so you don’t smudge it. Leave the reflections and the bottom parts of the the irises white. Leave the main highlight area defined earlier white. 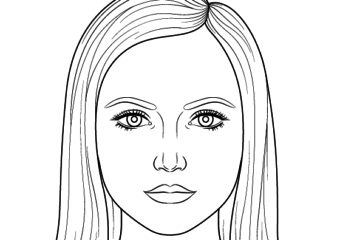 You will also want to create a sort of “broken up” white outline to define the nostrils. What you are basically drawing is a set of highlights that will help define the shape of the nostrils. You can also leave a tiny white highlight line in the middle to show the split in the nose. Completely shade both the bottom area of the mouth below the nose as well as the sides. 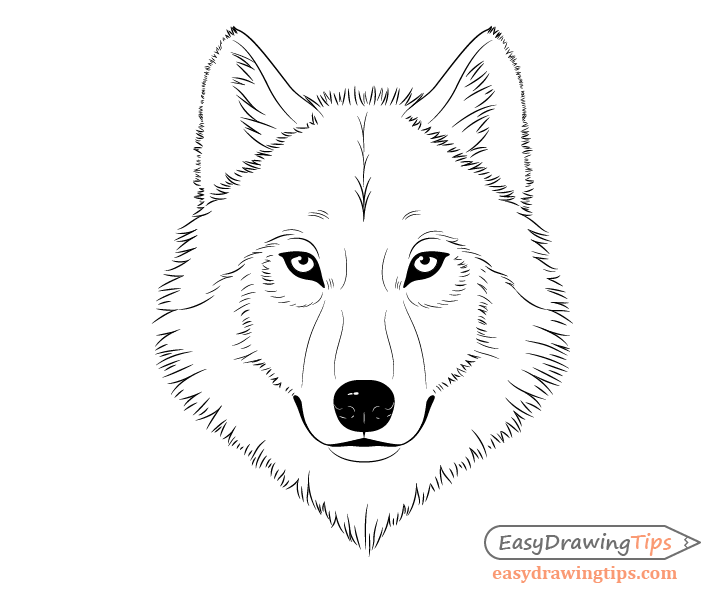 For this step add some fur patterns for the inner part of the wolf’s face. If you are going to be drawing the clumps using pencil over top of the construction lines you may have to erase the construction lines a small part at a time and then add in the clumps. Alternatively you can also lighter the entire line with an erase to the point where it’s barely visible so that you can keep it in the final drawing. Draw the fur for the outer parts of the ears with very tiny strokes forming a set of very small fur clumps. For the inner part of the ears you will generally want to draw much longer lines and larger clumps. Finally draw the last set of fur clumps that will eventually define the outer shape of the wolf’s face. These can pretty much be split into tree parts. One is the area at the top of the head between the ears. The second is the areas at the bottom of the ears. The rest is going down from the bottom of the ears and meeting at the bottom of the face. Again try and draw the fur lines to create an appearance of small clumps. Draw smaller or simpler clumps with just two lines. For larger clumps or more complex clumps draw two longer lines with some shorter lines in between them. Once you are done with the fur clean up your drawing and/or make any small tweaks that you need to. If you’ve been drawing with pencil and feel you still need to clean up/lighten some of the construction lines it may be a good idea to use a kneaded that you can mod into various shapes and use it to get in between the fur clumps. 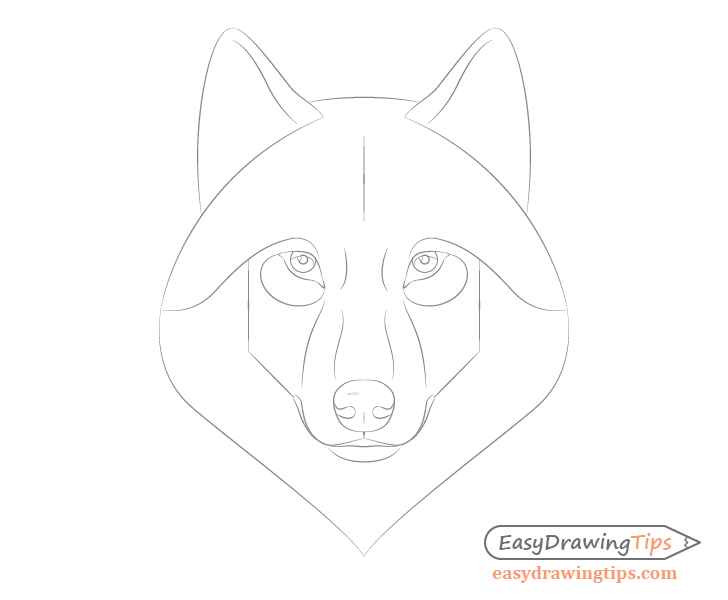 To finish the drawing you can give the wolf some whiskers. Generally these are fairly short and thin when compared to other animals such as cats. Draw them with just a few curved lines around the bottom outer sides of the snout. 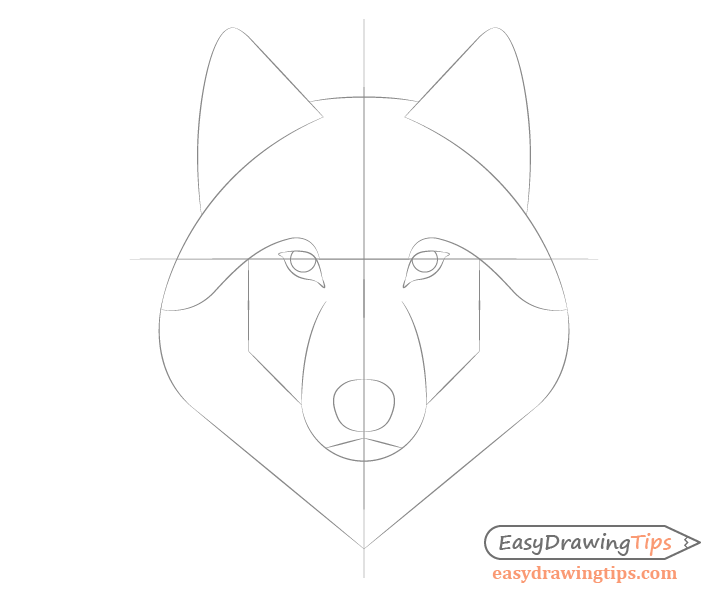 Once you are done you should have a finished line drawing of the wolf’s head. 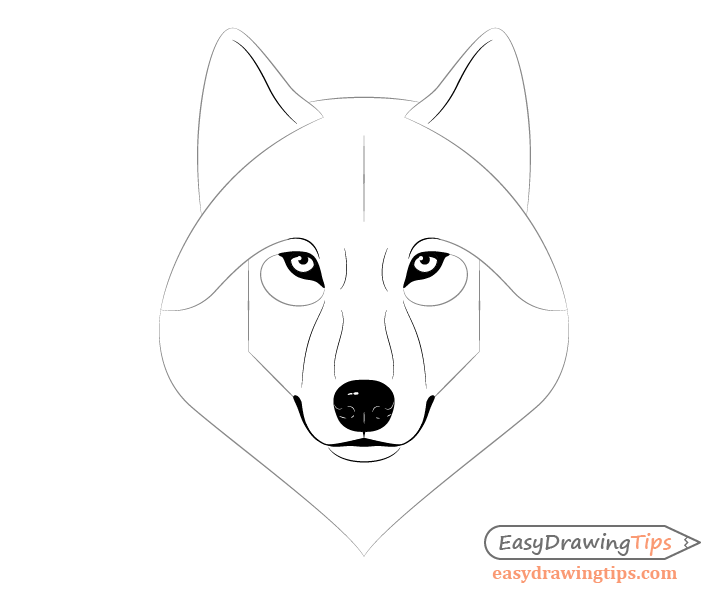 This tutorial shows how you can use lines and very minimal shading to create a fairly realistic looking animal. Though drawing the strokes for the fur can be quite time consuming you can end up with a much nicer looking drawing when you are done then if you were to draw with just simple outlines.